Jon Ludvig Hammer (OSS) and Anna Muzychuk (T-Com) have earned 7-round GM norms at the recently completed European Club Cup. Moreover, Anna had the best performance on the first board in women section. “PVK Kiev” Chess Club, seeded 5th in the Open Section before the competition, won a bronze medal on the best tiebreak among four teams with 11 match points. Ukrainian portal “Sport Online” dubbed this historic success as a main sports news of the day. Bellow are the statements of team’s officials. The top seeds did not leave their leading spot in the European Clup Cup 2008 after their draw against T-Com Podgorica and won the European Club trophy for the second time in a row with 12 points. The closest teams shared 2-4.places with 10 points but Spartak Vidnoe of Russia gained the second place with 19.5 board points followed by T-Com Podgorica from Montenegro which had 19 points.Economist Saratov’s 16.5 board points was not enough for a medal. Details below. When we ruled the world! 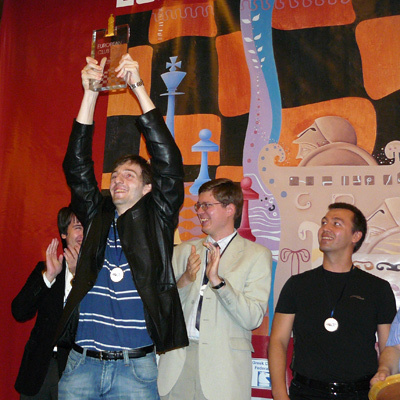 GM Alexander Grischuk is proudly waving the first price award under the chorus “…when I ruled the world…”. 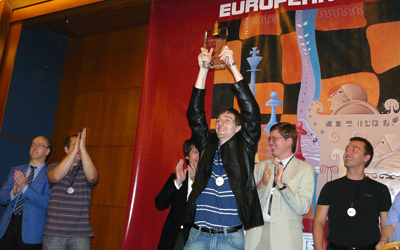 His team Ural won the 24th European Club Cup. Magnificent closing ceremony, photos, videos and interviews are on the way. We will keep updating! 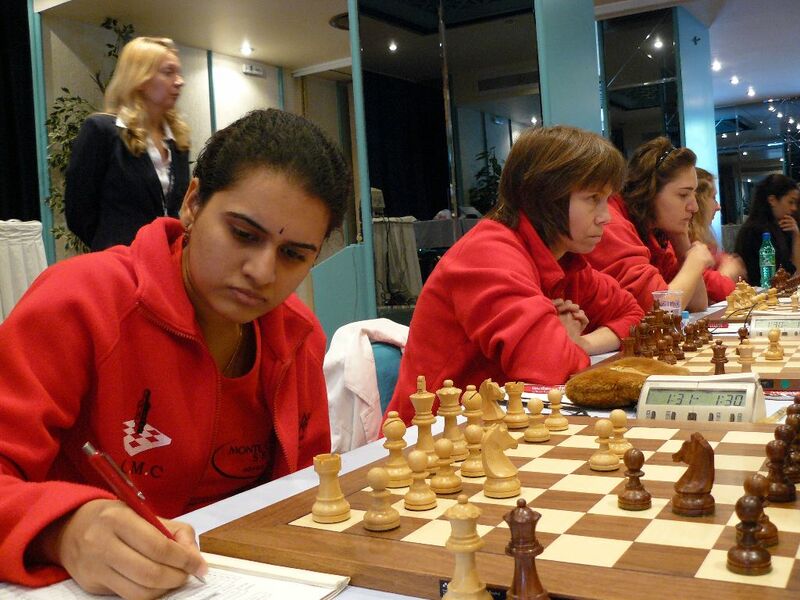 Cercle d’Echecs Monte Carlo wins the European Club Cup for Women. Congratulations! 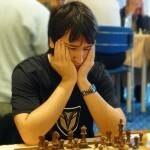 URAL Sverdlovskaya wins the European Club Cup – Open section. Congratulations! 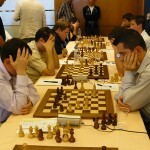 Grandmasters Vladimir Malakhov (7 games) and Artashes Minasian (6 games) have scored 100% on their boards with rating performances of 3187 and 3002 respectively. 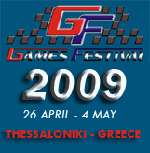 See full board lists – open section and women section. Interviews with WFM Fiona Steil-Antoni of Luxembourg, GM Krishnan Sasikiran of India and IM Romain Edouard of France.